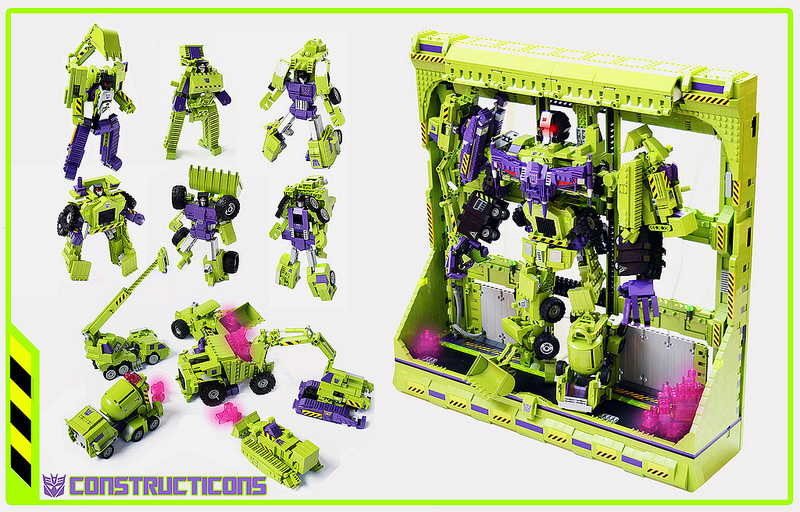 I’ve likely transformed these infamous Constructicons back and forth from vehicle to robot forms and into their larger combination of Devastator a million times back in the 80’s. Builder Alex Jones did an amazing job recreating these into their LEGO equivalents. 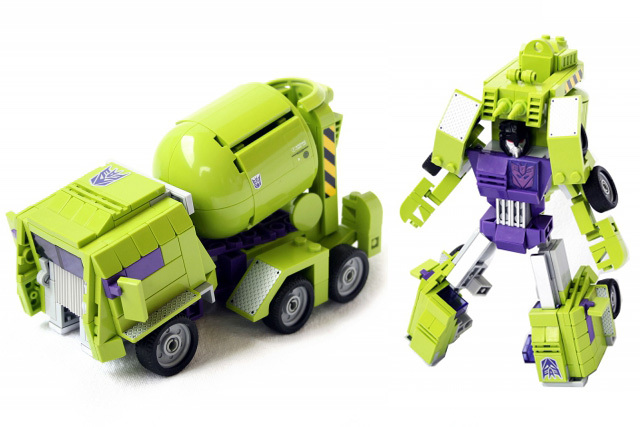 What brings all the nostalgia back are their accurate color schemes of lime green and purple and the amazing resemblance of the individual construction-related vehicles. 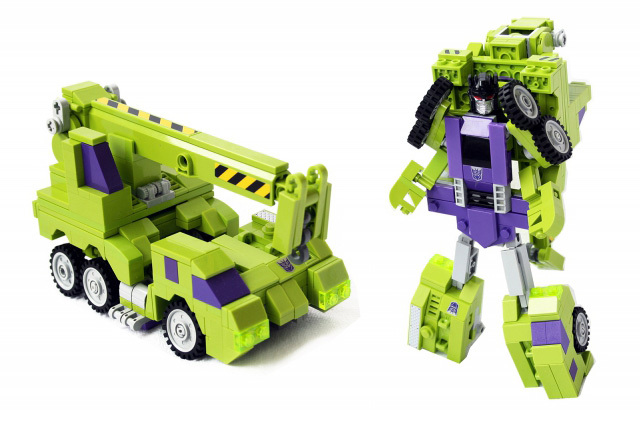 While it’s granted they’ll never be quite perfect at transforming due to the limitations of LEGO bricks, I’d say this is one very admirable attempt. Alex says that it was an on-and-off work in progress for the past 3 years, and it’s definitely worth the time and patience put into it. 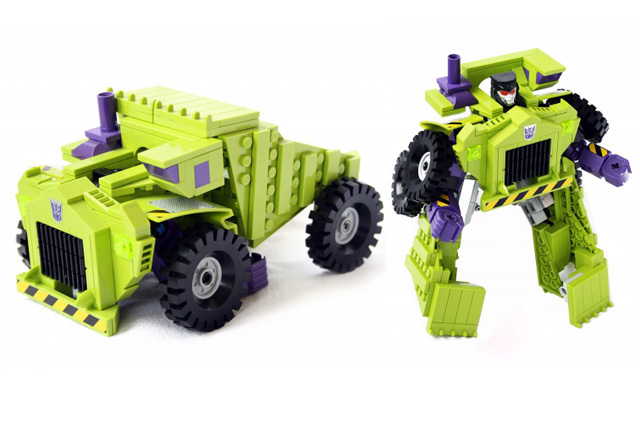 Scrapper looks pretty good up close in both its vehicle and robot modes. It’s quite clever how Mixmaster’s rotating mixing drum was created using the round corner dome tops. Hook is just as I remember it. 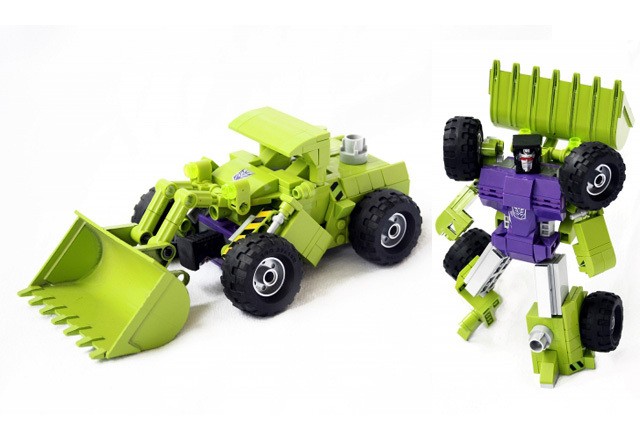 Bonecrusher with the elongated legs and track threads using the 1×2 grille elements just nails the look. 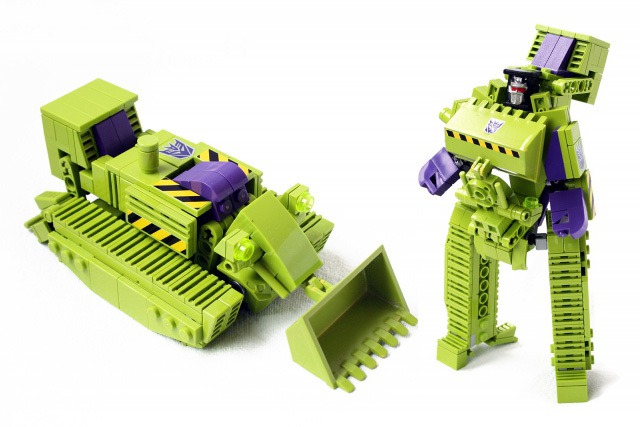 Scavenger looks great with the detailing of the pneumatic detailing for an excavator. Longhaul is as good as it gets with the limitation of LEGO elements. 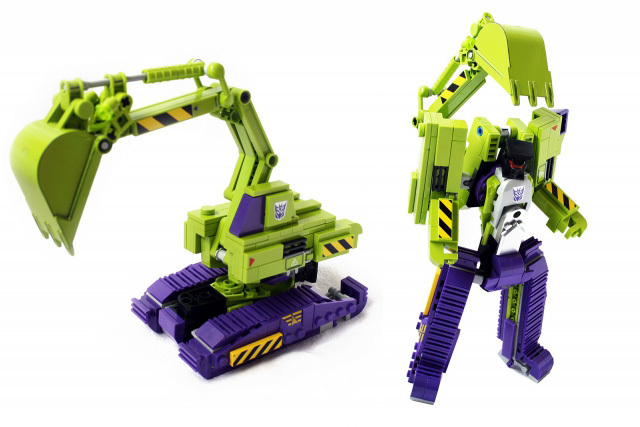 These accessories came separately in the original setup and are needed for the final transformation for Devastator. 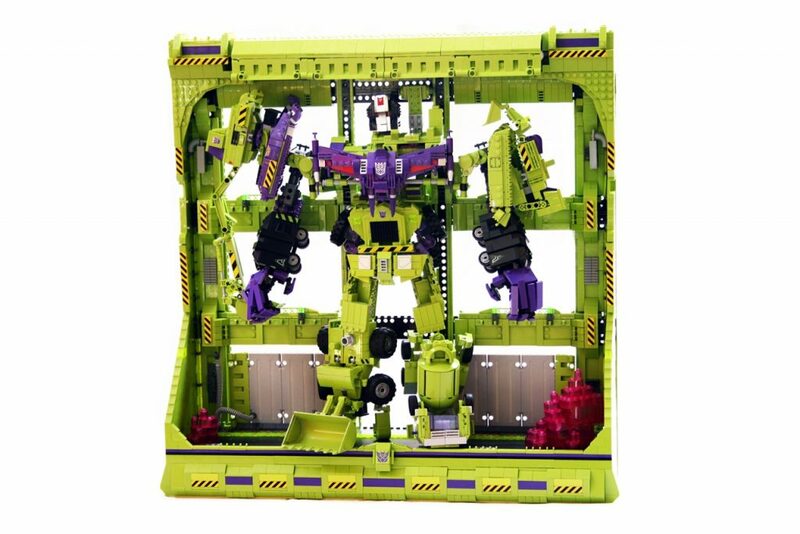 The completed transformation is displayed in a LEGO built frame in all its glory. It’s definitely worth a visit to Alex’s pages for more detailed and alternate closeups of all the vehicles and builds. Shut up and take my money! NOW! 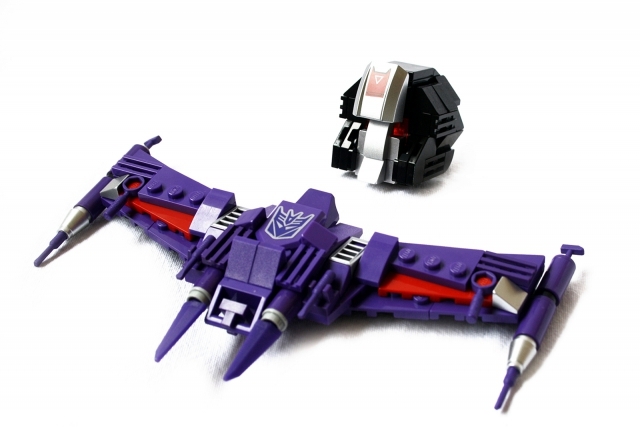 Are those heads custom, or are they picked up from Kre-O or something? I was wondering the same thing about the heads.